Our GRANDfather horse holds a special position of respect in our herd. He has lead with kind fairness, and now we all want to return the favor, we all want to protect him. 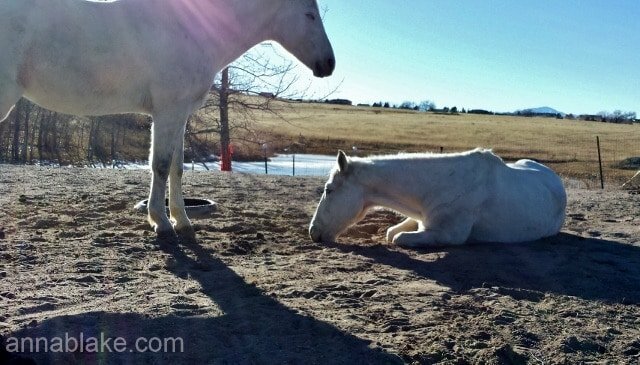 Cold weather is cruel to old bodies, and in the afternoon light, a young gelding stands watch while the sun warms his GRANDfather bones. Nothing so precious, nothing so grand. GrandFather Horse is such a Love Story…. I, too, have a grandfather gelding. He is still very vibrant at 29. He luxuriates in a thick gray fur coat and is still a very easy keeper. He runs the dry lot with his two friends Kate, a 40+ yr old pony mule, and the youngster, Sage, my more than fluffy Haflinger mare. Kiss your grandfather on the nose and I will do the same! What a precious pen you have, kisses exchanged!